Welcome to the 2015 Digital Media and Developing Minds Conference, an Albert M. Sackler Colloquium of the National Academy of Sciences. I’m Dr. Pamela Hurst-Della Pietra, President of the Institute of Digital Media and Child Development. I founded the Institute, and initiated the planning of this conference, to answer three deceptively simple questions. How I came to ask those questions is a tale to which many of you should be able to relate. Years ago, I began to notice the rapidly increasing extent to which children, at all ages and stages, were immersed in digital media. They were swimming in oceans of data, being buffeted by storms of electronic stimuli, and participating in virtual relationships so vivid that actual friendships and families paled in comparison. Are digital media enhancing or impairing children’s ability to live happy, healthy, and productive lives? I turned first to academic journals and local university professors for answers. The more studies and reports I read, though, and the more I talked with neuroscientists, pediatricians, psychologists, and industry experts, the more clearly I saw why definitive answers were hard to find. I found many slivers of deep insight – pieces of a larger puzzle – but never quite enough to synthesize into authoritative, data-driven, practical guidance. I observed that academic disciplines used different vocabularies to describe the same phenomena, used field-specific research methods, and generally operated within their own well-defined intellectual boundaries. Important research got done, but reading it left me with the strong sense that crucial knowledge was being overlooked in the gaps between disciplines. Similar gaps existed between academic and corporate researchers, between consumer advocates and government agencies, and between scholars and clinicians. As research subcultures developed around particular types of digital media, different stages of child development, and different funding sources, the research community became even more Balkanized. People who might have produced breakthroughs together were instead hunkered down inside separate intellectual silos. I also noted that, with disturbing frequency, the bright line between scholarship and advocacy has become blurry. Together, these things made some projects impossible, inhibited others, and raised issues of ideology and credibility that frustrated me as a philanthropist and child advocate. Now is the time to explore all the in-between spaces. Media technologies evolve. So does our relationship to them, and so too, must our approach to understanding that relationship. That is why I welcome you to this colloquium with a call for multidisciplinary action. 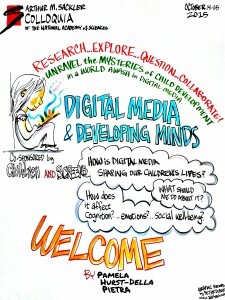 Employ the power of collaborative inquiry to understand the influence of digital media on the whole child, and on the society to which that child is an heir. Make use of your respective fields’ particular strengths, but share them. Help others to understand how your corner of the big picture relates to theirs, and how your tools and methods might shed new light on their investigations. Invite them to do the same. Synthesize. Integrate. Collaborate. Individually, you are incredibly bright, but collectively, you cast a brilliant, penetrating light. This conference is designed to unleash your curiosity and to capitalize on your willingness to learn from and teach others. I stress this because we seem to live in an age of polarization. Too often, exchanges of views emphasize and amplify differences rather than narrow them. We all have preconceptions and assumptions that reflect our training, experience, and institutional affiliations. Set them aside for now. Treat your time together as an intellectual “free-trade zone” – a place where it’s safe to offer, and accept, insights from unfamiliar sources. Imagination will be as important here as curiosity. A number of the upcoming sessions will challenge your capabilities as futurists. How else can we hope to prepare today’s digital natives, and tomorrow’s, for careers, relationships, and social lives about which we can only speculate? Dare to make the necessary leaps, but don’t stop there. Think also about how to validate your theories and apply them. The presence of so many of people of such stature creates a remarkable opportunity. Seize upon this chance to see your own life’s work through the eyes of someone who looks at the same things as you do, but in an entirely different way. Let that experience inspire you to set ambitious new goals, devise novel research strategies, and do things together that you could not do alone. The man next to you, the woman you meet tonight at dinner, your fellow panelist – these may be the people with whom you unravel the mysteries of child development in the digital age. Our speakers, panel topics, and moderators have been selected to promote encounters among unusual combinations of experts. Question-and-Answer sessions, diverse panels, and roundtable discussions will provide ample opportunities for give and take. So, too, will the breaks and group meals built into our schedule. Ask, and answer, as many questions as you can. Introduce people you already know to each other, and let them do the same for you. If all this activity begins to wear you out, just remember that the next person you meet may hold the key to your next great achievement. finally, devise practical, actionable recommendations that parents and teachers can use to make digital media a more consistently constructive influence in children’s lives. Even as we begin, the organization, synthesis, and dissemination of your new ideas already is under way. Collaborative White Papers produced by conference-related workgroups are being prepared for publication. I look forward to sharing further details once the peer review process is complete. In addition, I’m pleased to announce that the Institute of Digital Media and Child Development is assembling a coalition of organizations to field test your collective recommendations. Initial partners include the Child Mind Institute, public broadcaster WNYC, National Public Radio, and the New York Hall of Science. Primary care pediatricians and parents will join this effort soon. There is more to be said about the future, but for now, let me close with a few words of well-deserved thanks. 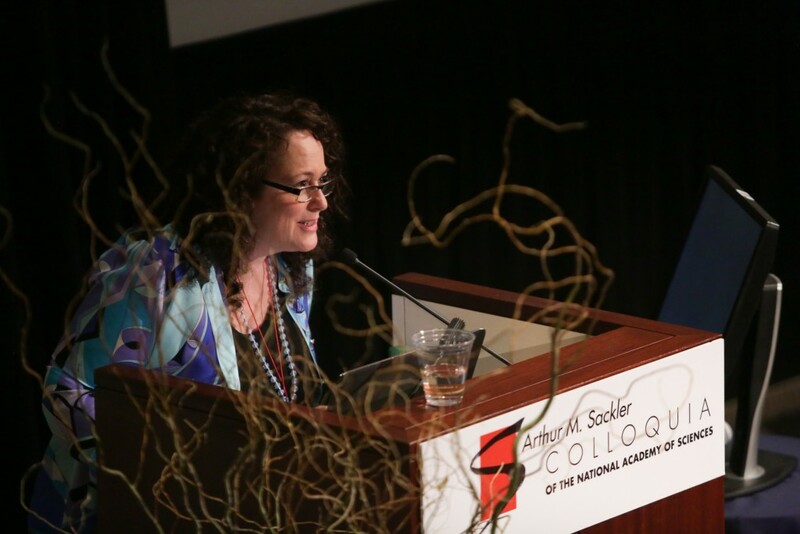 Susan Marty of the National Academy of Sciences, the Academy’s Committee for Scientific Programs, and Stanford’s Dr. David Donoho have been indispensable contributors to the planning of this conference. David was among the earliest supporters of this effort. Vicky Rideout helped nurture the seed of an idea that eventually grew into all this. For the last year, it’s been my honor to work on the conception and execution of this event with Dr. David Meyer of the University of Michigan’s Brain, Cognition and Action Laboratory, and Dr. Jane Brown, the James L. Knight Professor Emerita at the University of North Carolina – Chapel Hill’s School of Journalism and Mass Communications. I am pleased to share my hosting duties here with them. Thanks also to my staff Julie Grimaldi, Melli Pini and June Ramadhan at the Institute of Digital Media and Child Development. They will be here throughout the conference to make sure that your experience here is pleasant and productive. Most especially, thanks to each of you for making your way here, and for embarking on the journey we’re about to take together. Let’s get to work!